The automobile and motorcycle were still novelties in the 1930s and racing was popular. These labels have adhesive backs and were meant to be applied to luggage, discount viagra pills cars, cialis sales levitra or blank postcards sent as advertisements or “greetings from.” As noted in an earlier post on another race, these labels are related to both luggage labels and poster stamps. 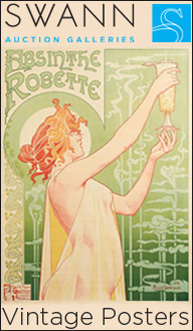 All were means of advertising in a world in which color printing was expensive. These two original labels represent a race in Czechoslovakia and one in Austria. 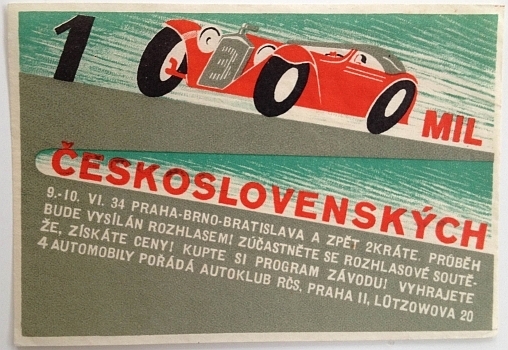 The Czech label is for a round-trip race between the main cities of Czechoslovakia. The translation is: “1000 miles through Czechoslovakia” (the wheels of the car are also zeroes) [thanks to Michal in the comments for translating this properly! ], 9 – 10 June 1934 Prague – Brno – Bratislava and back 2 times. The race will be broadcast by radio! Take part in a radio contest get prizes! Buy the program! Win 4 cars. Organized by the Autoclub Republic of Czechoslovakia, Prague 2, Lutzowova 20.” The label is unsigned. The second label is for a motorcycle race in Austria and is also unsigned. 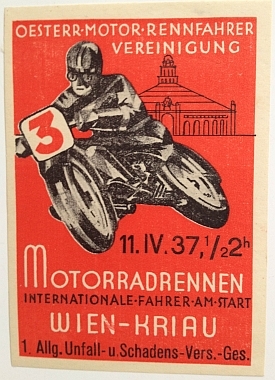 The translation is “Austrian Motor Racing Association, 11 April 1937 1:30PM, Motorcycle Race at Vienna-Kriau.” This race track still exists in Vienna today. Austrian Motor Racing Association, 11 April 1937 1:30PM, Motorcycle Race at Vienna-Kriau. Hi David. The Czechoslovak label actually says “1000 Czechoslovakian miles”. The car wheels double as zeroes, interesting design element.